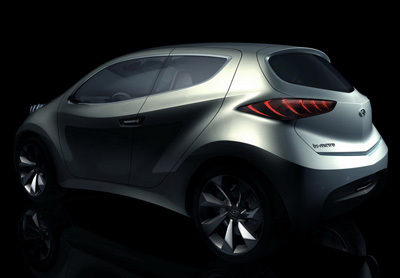 The Hyundai ix-Metro is a Hybrid Electric CUV (Compact Utility Vehicle) designed to compete in the European sub-B segment. 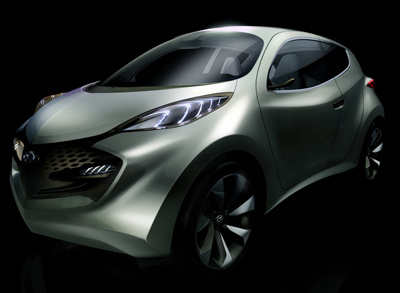 The ix-Metro is the fifth concept in a series of vehicles created by Hyundai's Global Design Team based in Namyang, South Korea. The ix-Metro's hybrid drivetrain consists of a 1.0 litre, turbocharged three-cylinder engine with direct injection and dual CVVT (Continuous Variable Valve Timing). This is combined with a six-speed dual clutch transmission, and an electric motor. With its frugal drivetrain the Hyundai ix-Metro promises CO2 emissions of just 80g/km. The styling of the ix-Metro is daring to say the least. This is in part due to the design influences. "We wanted the ix-Metro to be something out of this world. We took our inspiration from NASA and even sci-fi movies because spacecraft are universally understood symbols of progress and innovation," explained Rogelio J. Flores, Chief designer on the ix-Metro project. The front has a gaping and aggressive grille which would not look out of place on a high-powered sports vehicle. Of particular interest are the unique ice-blue LED headlights which have a distinctive scale-like design motif, this design cue is carried over to the taillights. In profile the ix-Metro shows off its four doors, however due to the positioning of the door handles and the apparent lack of any B-pillars, at first glance it appears to be a two-door vehicle. Instead however it has conventional front doors, while the rear doors slide backwards to allow access to the rear sears. The pillar less design not only enlarges the greenhouse to improve all-round visibility, but more importantly allows easier entry and egress into the rear passenger area. The interior of the Hyundai ix-Metro is as adventurous as the exterior. Taking inspiration from sci-fi movies, the designers have chosen a white semi-transparent silicon-like material to cover the dashboard area, which conceals the central display to deliver route information and key controls. 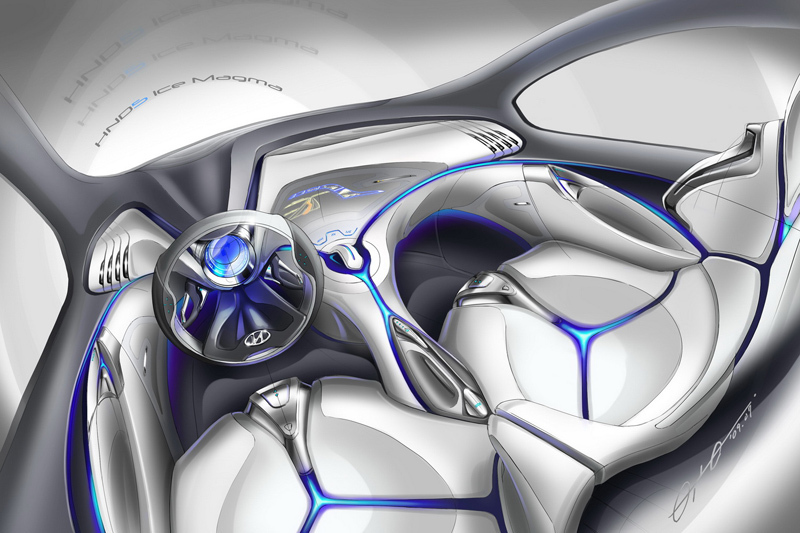 The complicated organic shapes, and panels separated by brightly colored highlighting strips look futuristic and daring for what is essentially an everyday vehicle.